I kind of feel like candles are a beauty bloggers sweet spot. They look pretty as decoration in blog photography, they are nice to review and smell lovely. Of course I'm sure there are beauty bloggers out there that have zero interest in candles but I'm certainly not one of them, with a stash of wax to rival the shelves of my local Hallmark shop. Above is a snippet of my collection that I'm currently burning and enjoying. 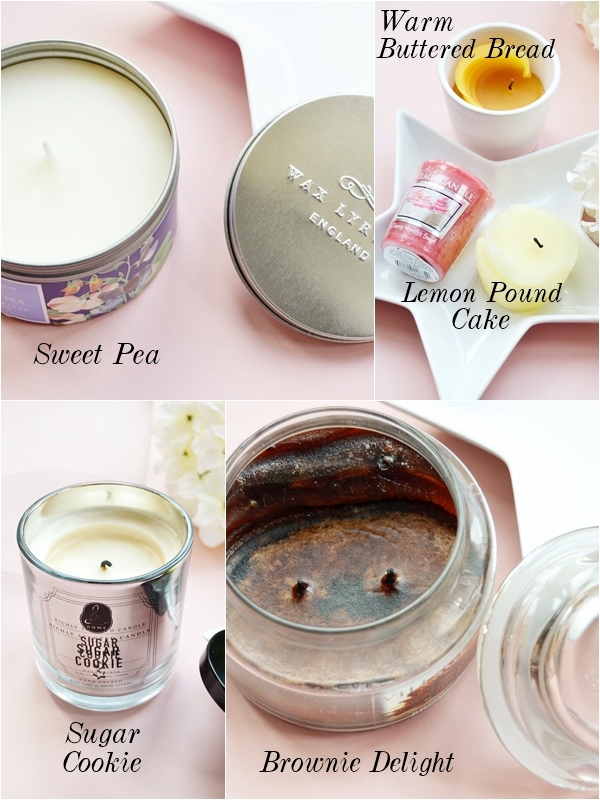 So I thought I'd share with you a few of my current favourite scents and the candle brands I will always go back to. Believe it or not, Yankee Candle isn't my favourite candle brand! Instead my go-to home fragrance brand is Village Candle, a candle brand easily mistaken as a knock-off of YC but in fact quite a bit more true to scent and with so many fragrance options to pick from. My all time favourite candle from Village Candle is Brownie Delight which as you can see is running on the low side (FYI - I plan to scrape out the unburnt wax at the side and use in a wax tart burner once it's completely finished with). Within minutes of lighting this candle my open plan living room/dining room/kitchen is filled with the richest chocolate brownie scent that is so true to the real scent that it often makes me hungry but also warm and comforted. This truly is my favourite scent to burn and one I will always re-purchase and burn any time of year! Along side medium to large jars, Village Candle also offer votive candles that are an inexpensive way to try out more scents from the brand. I generally pick these up from eBay for around £2.50 including delivery and have tried quite a few amazing scents now. I'm currently trying out Warm Buttered Bread, Lemon Pound Cake, Maple Butter and Cherry Vanilla Swirl - all of which I love! My favourite scent from trying out the votive candles is Warm Buttered Bread as it's just such a unique scent that leans more on the savoury side which makes a nice change and again it's such a true to life scent that fills the room for hours. I also love Lemon Pound Cake as it's fresh but moreish and just as if I've been baking. If you love Yankee Candle already or you're after a new candle brand to try out then this is certainly the one! Where to buy - I personally find it easiest to purchase from eBay but select Hallmark stores do stock them. Brownie Delight Medium Double Wick Jar (£12.99 - eBay here), selection of votive candles (from £2.78 - eBay here). Wax Lyrical is a home fragrance brand that's been going strong for years and can easily be found it quite a few supermarkets. The Wax Lyrical shelf in my local Tesco generally distracts me from food shopping as their candle tins are inexpensive at £6.00 (frequently reduced/on offer) and the scents are always in line with the season, my favourite time of year for Wax Lyrical being Christmas as they come out with some amazing scents - think Figgy Pudding, Mulled Wine and Christmas Cookies! My new favourite is a lovely spring floral scent in Sweet Pea, this is part of the RHS Garden range and is just perfect for this time of year. As the candle tim is on the small size, though it has a burn time of 25 hours, I like to burn it in a smaller room to achieve the best scent throw but I've found the scent is most noticeable once I've blown the candle out, which is different from all the other candles I've burnt in the past. As for the 'sweet pea' scent it's well, sweet, and floral and very spring appropriate and clean. I also love Wax Lyrical for reed diffusers, again mostly at Christmas time as they excel themselves but sometimes as a treat to myself throughout the year. Where to buy - Tesco and Waitrose seem to be the best stockists of Wax Lyrical. You can also always find a bargain or two on Tesco Direct of past ranges/stock here. Another place I like to shop for candles is TK Maxx as they generally have an extension and affordable range. It also encourages me to try out different brands and get something that bit different when it comes to the candle packaging. The above mirrored Sugar Cookie Candle was something I picked up last Christmas for under £5 and initially purchased due to how it looked but it's in fact a lovely candle to burn and not just at Christmas. You can sometimes find discounted Yankee Candles in TK Maxx but I find it's best just to be led by your nose and pick out something that grabs you or just looks pretty - certainly the place to go if you are wanting an aesthetically pleasing candle or lantern for your desk. Where to buy - This is self explanatory but I would say that if you have a Homesense store near you then visit it! They stock an extensive range of candles and the rest of the store is just amazing - I'm yet to leave empty handed! 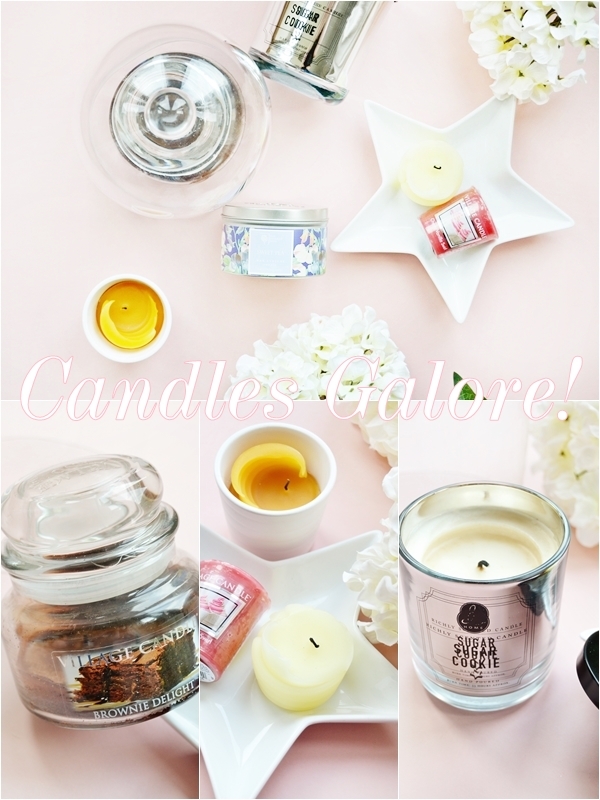 Candles to try soon - the new range of large jar candles from Home Bargains that look very similar to Bath & Body Works candles, the Jo Malone Pomegranate Noir dupe found in Aldi for £2.99 and more votives from Village Candle. I'd love to know your own favourite candle brands!